Establishing your own business takes a lot of planning. There are so many things to consider that can make or break your chances of succeeding as an entrepreneur. First, the line of business you want to venture in; second, the business partners that you will choose to work with; and lastly, the location of your business. Out of the three (3) factors, choosing a business location might always seem to be taken for granted. Young entrepreneurs think that coming up with a brilliant business idea is all it takes to succeed. Ever wonder why McDonald’s are always jam-packed considering that their food is mediocre at best? It’s because they always look for the best locations in the marketplace to provide convenience to consumers. In other words, a businessperson should invest in real estate (business location) as much they invest in their products and services. In reality, finding the perfect location for your business is easier said than done. Whether you decide to rent or purchase a property in a commercial or business district in Australia, it would still significantly affect your overall budget. For this reason, it’s good to have alternatives that would let you maintain an office in a CBD area without the high cost, and this can only be possible with the help of a Virtual Address in Brisbane. So, what exactly is a Virtual Address and why is it so in demand nowadays, especially for SMEs and startups? When setting up your own business, you will need to make some major decisions. And part of that decision is to decide where you want to set up your business – it may be in your own home, rented office, or purchased property. There are many options for you to consider, but that decision will depend on what image you want to portray for your business. Try to imagine this: You decided to set up your office at home and do all your business meetings in an office space that allows you to rent on an hourly or daily basis. You may have given your clients the good image by conducting your meetings in professional-looking places, but the registered address of your company is under your residential address. Some clients will probably ignore this, but most of them will probably lose confidence in dealing business with your company. In setting up a business, image is one big factor that you need to work on, most especially if your business is just starting up. As funny as it sounds, you have to let your clients believe that your company is bigger than it actually is. In this way, you are building your company’s reputation, which will make it easier for your future clients to entrust their business to your company. Lucky for you, in today’s modern age and easy access to technology, Virtual Address is one solution that you can consider in having for your business. Don’t be misguided by the word “virtual” in its name. Virtual Address is in fact a legitimate and real address. Most companies who offer this kind of service also provides other services (Virtual Receptionist, Virtual Assistant, 1300 numbers) that would make things easier for the account holder to implement their business as smoothly as possible. The word “virtual” refers to your business not operating in the physical address of your chosen location, but uses the address in a virtual way. A Virtual Address is designed to be used as a point of reference for your business - think of it as a masking tool or a cover up. The best example for this is the marketing collaterals that are required to build your company’s image like business cards, websites, and brochures where your business address is imprinted on. Virtual Addresses are popular amongst home-based businesses or startup companies who intend to project a professional image or wants to make their business look big. Why is that so? As a startup company, you wish to cut overhead costs like renting a physical office, most especially if it’s a one-man company. Aside from being impractical, you do not want to rent an office if there’s only one person who will utilize it, right? While it’s your intention to lower your cost, you do not wish to lower your company’s reputation, and this is where a Virtual Address can help your business. You may not have a physical office where you actually do your work, but you're reaping the benefit of having one because your clients know that your business is located in a CBD area. Little do they know, you are actually operating in your kitchen, dining area, or even a coffee shop. Aside from helping your business cut its overhead cost, this kind of service gives you the flexibility that allows you to have the freedom to work anywhere you want without being forced to work in a four-walled room every single day. What’s the Difference Between Physical and Virtual Address? In this modern age and innovation of technology, a lot of entrepreneurs are using technology to their advantage by offering a Virtual Office in Brisbane. If you want to start a business but do not have a large capital, a Virtual Office is one of the solutions that you can consider for your business. It is known to many that getting a Virtual Office means saving money from overhead costs like office rentals, purchasing of office equipment and supplies, and salary of your staff. Technology has allowed our businesses to operate at home and run it online. Most entrepreneurs have taken advantage of the ability to work from a Virtual Office in Brisbane. After all, with the rampant usage of Internet, almost everything is available online. If you wish to venture in a new business, the first thing that you need to decide is where to operate your business. The question that you need to ask yourself is: Do you need to set up your business in a traditional address (physical address) or a Virtual Address? You are probably wondering what’s the difference between the two and what are the benefits you can get from it. Physical address or traditional office literally provides you a physical office – where you and your staff will report every day and a place where the core of your company’s operations take place. On the other hand, a Virtual Address is also considered an actual address, but your business is not physically operating in that location. You can be operating at the comfort of your own home or at a beach, yet still your clients won’t even have a clue where you’re doing the actual work. You are only using the address to present your company through your marketing collaterals like your business card and your company’s website. Save Money. Having a Virtual Address provides your company a cost-efficient solution. After all, overhead costs are what most startups try to avoid. With Virtual Address, you can save on rental fee and office supplies. While with a physical address, you have to pay deposits and invest in office equipment. Flexibility. Virtual Address gives you the flexibility to work anywhere you want. You have the freedom to be where you want to be while running your business. You are not forced to go to the office and maximize the money that you are paying for the rent if you opt for the virtual alternative. Save Time. By having a physical address for your company, it means that you need to travel and deal with all kinds of stress that you may encounter on a daily basis. Travelling forces you to wake up early, prepare yourself for work, and probably be stuck in traffic on your way to your office and going back to your house. You can save this wasted time when you get a Virtual Address for your business. Those extra hours that you will spend when you opt for physical address can be put to good use when you go for Virtual Address instead. You can use those extra hours to spend more time in bed to rest or more time for your family. Protecting Mother Earth. No daily travel means less pollution. If your office employs 5 people, and all of them happen to have a car, then your company has significantly helped in reducing global warming – it may also apply to the electricity that you will save without a physical office. When you’re considering a Virtual Office vs. traditional office, a Virtual Office is the best option for a business that wants to save money while concentrating on growth and planning for the future. 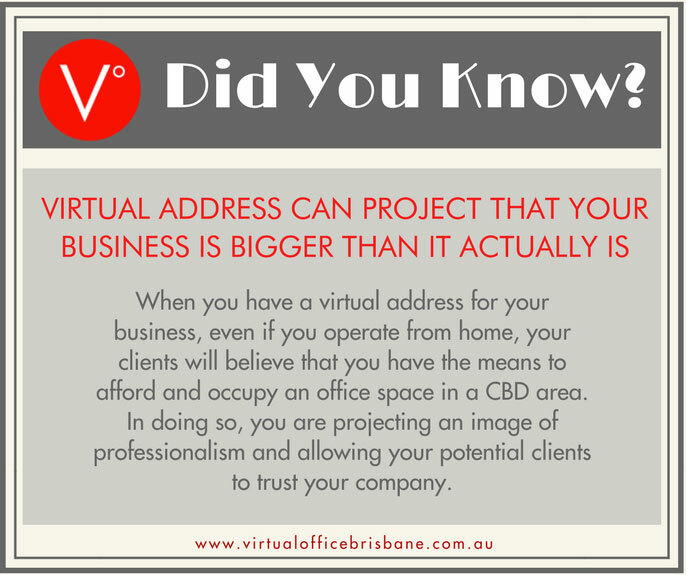 How Can a Virtual Address Help Your Brisbane Business? One of the most significant issues that a startup company is facing happens to be the utilization of office space. Having a full-time rented office can be extremely costly and will scrape off a hefty amount from your bank. With your business just starting its operations, the last thing that you want to think about is the rent when you go to a physical office. If your business requires minimal interactions with your clients and can primarily work via online, you need to consider a Virtual Address. It provides your business an excellent solution to keep your money growing and in a place where it should be – the bank. It also provides a professional corporate image at a lower cost. While there are many companies offering Virtual Office in Brisbane that can accommodate your business, the most important thing is to utilize the most cost-effective solution for your company. There are companies who offer this type of service alongside with other services like Live Answering Service in Brisbane, which allows you to establish a corporate image with all the virtual resources in place at an affordable price. Getting a Virtual Office in Brisbane can offer a great alternative for new and existing businesses to establish their reputation, convey professionalism to their clients, and save a significant amount from rental fees and other overhead costs from a physical set up. 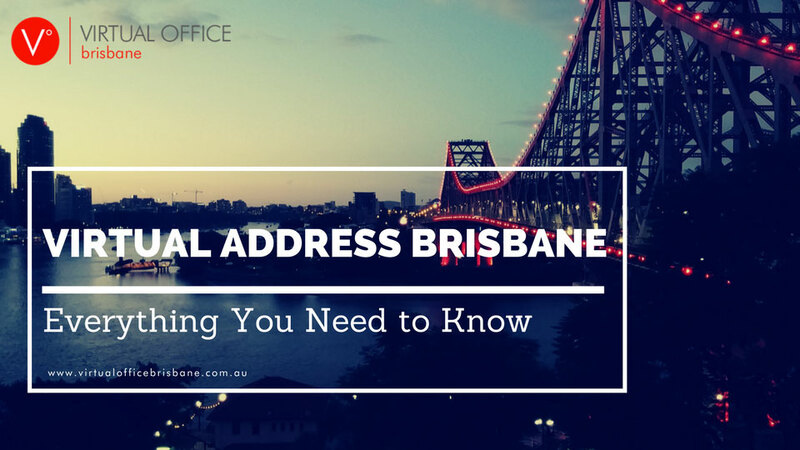 Where Can I Find a Virtual Address Service Provider in Brisbane? For companies who are interested in taking their business to the next level, you’ll be able to find so many Virtual Office providers over the Internet. Some are trustworthy, while some are scammers who are just roaming the Internet to find their next victim. 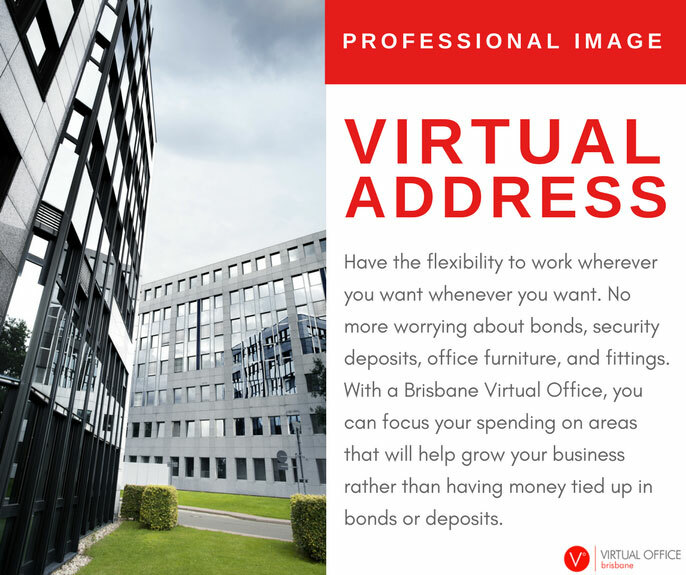 For entrepreneurs who are serious in finding the perfect partner that would provide them with the most ideal Virtual Address, you should try Virtual Office Brisbane (VOB), a subsidiary company of Virtual HQ, one the leading Virtual Office service providers in Australia. Aside from Brisbane, Virtual HQ offers over 50 prime locations throughout Australia, as well as in other parts of the world like USA and London. VOB offers a countrywide network of business centres to provide your company a presence in a specific market for a fraction of the cost of getting your own office. With a Virtual Office service, you are only required to pay for what you need (no hidden charges and no additional costs), making it very affordable for the account holders to expand their business in another location aside from the city their business is registered. It also leaves you with enough funds to avail other virtual services that may help you maintain your business easier – like having your own Virtual Assistant. 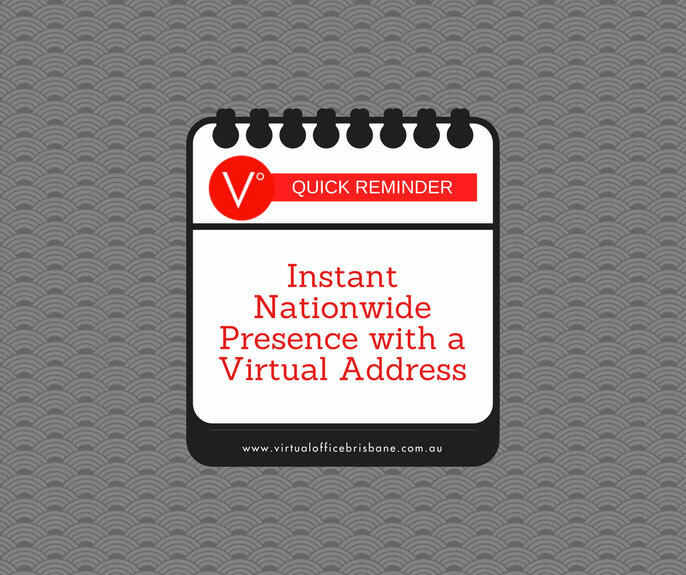 Many account holders take advantage of this by getting more than one Virtual Business Address within Australia to give their business an instant nationwide presence, which makes your company bigger than it actually is. You only have to accomplish 3 easy steps to sign up for a Virtual Address: First, we will require an identification card (ID) with photo, either a passport or Australian Driver’s License, to be scanned and emailed/faxed to us. Second, you need to complete our email enquiry form, which consists of information on which business centre locations you need for your new Virtual Address. Third, we will communicate with you to arrange the payment for the Virtual Address subscription. The payment for the service can only be via Electronic Fund Transfer (EFT) to our provided bank account. When you avail VOB’s Prestigious Mail Address (Virtual Office Address) at any of our business centres, we will automatically issue you with a unique suite number that you can use on your business card, brochures, website, and other marketing collaterals. All mails and packages will be kept safe until you have the time to pick it up. 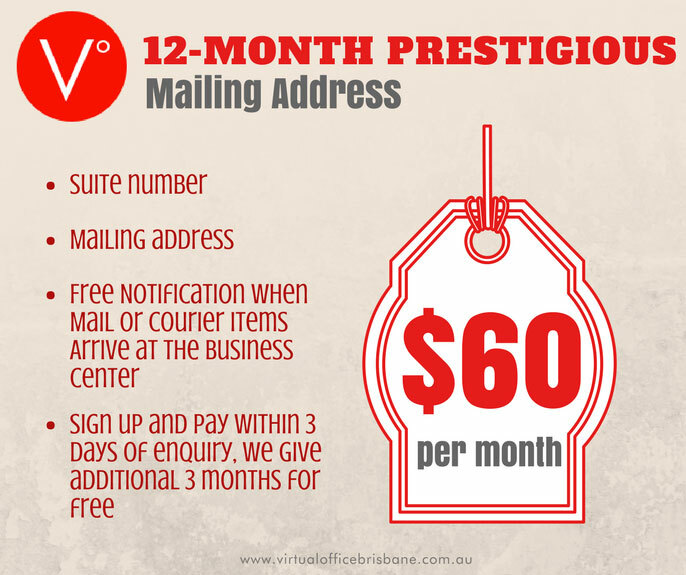 How Much Does a Brisbane Virtual Address Cost? Just like the affordability that a telephone answering service in Brisbane can provide, availing a Virtual Address service for your company will make you look like a great entrepreneur in terms of how much money you can save for your business. With VOB, you pay as low as $60 per month ($720 annual fee) if you avail the 12-month package. Not only that, but you’re also given 3 extra months for free, making it just $11 a week for your first 15 months as an account holder. Considering how cost-effective it is to avail a Virtual Address, this makes the amount almost immaterial for most companies. As a result, more businesses are enticed to explore the option of getting multiple Virtual Offices from different Australian CBD centres. For instance, availing 5 Virtual Office Addresses nationwide would just cost you $300. 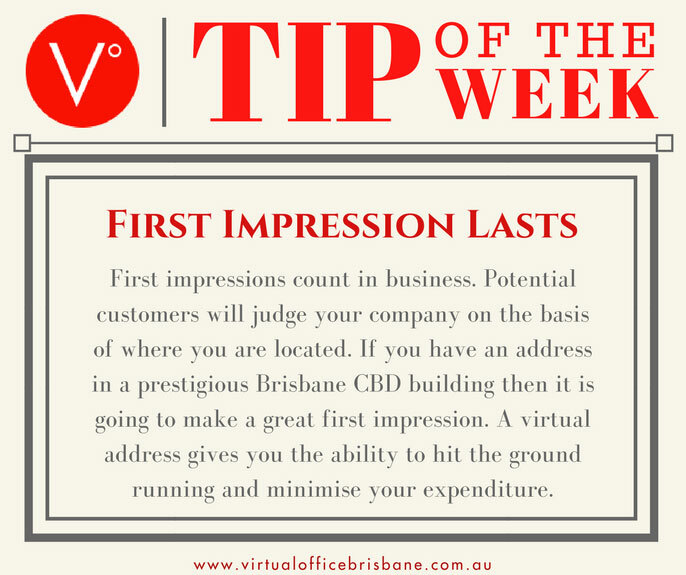 This amount can even be compared to the cost of a family dinner at a decent restaurant or buying an off-the-rack suit – both purchases can be done without affecting much of your monthly budget, which makes Virtual Address in Brisbane an ideal choice for every aspiring businessperson out there. It doesn’t matter what size of business you are running, whether you are a single person working from home or a growing business without a permanent base of operations, a Virtual Office can help you keep your budget on track and at the same time allows your company to project a better image. It's a really affordable service!